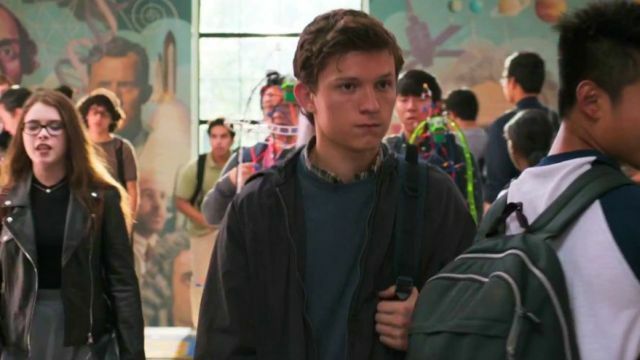 The webslinger himself, Tom Holland, sat down for a special live Q&A on the official Spider-Man Facebook page to answer a ton of fan questions and in it, he revealed some things that might get him in a bit of trouble, like some scenes from the upcoming movie as well as his secret preparation for the role… enrolling in a high school in secret. “The coolest thing I think I did for the movie was I was enrolled in a high school in New York, in the Bronx, as a secret. No one knew who I was or what I was doing. I had a fake name and a fake accent. I went to school for three days. It was really fun. It was really interesting because New York high schools are so different to schools that I went to in London. Where I went to a school where you have to wear a suit and tie and it’s all boys, and for me it was the first time that I was in a classroom with girls. It was a really strange experience, it was really fun. Check out the full video in the player below! A young Peter Parker/Spider-Man (Tom Holland), who made his sensational debut in Captain America: Civil War, begins to navigate his newfound identity as the web-slinging super hero in Spider-Man: Homecoming. Thrilled by his experience with the Avengers, Peter returns home, where he lives with his Aunt May (Marisa Tomei), under the watchful eye of his new mentor Tony Stark (Robert Downey, Jr.). Peter tries to fall back into his normal daily routine – distracted by thoughts of proving himself to be more than just your friendly neighborhood Spider-Man – but when the Vulture (Michael Keaton) emerges as a new villain, everything that Peter holds most important will be threatened. Spider-Man: Homecoming also stars Zendaya, Jon Favreau, Donald Glover and Tyne Daly. Directed by Jon Watts, Spider-Man: Homecoming was written by Jonathan Goldstein & John Francis Daley, Jon Watts & Christopher Ford, and Chris McKenna & Erik Sommers. The film is produced by Kevin Feige and Amy Pascal, and executive produced by Louis D’Esposito, Victoria Alonso, Patricia Whitcher, Jeremy Latcham, and Stan Lee. Spider-Man: Homecoming will swing into theaters on July 7, 2017.